Buying a Replacement Hot Tub Pump? Read This First! Your hot tub pump is an essential component of the entire spa system. If it starts to malfunction, it’s important to either repair the part right away, or replace it altogether. There are a few telltale signs that you hot tub’s pump is faltering, including issues with shafts or bearings, humming noises, a jammed impeller, and a faulty staring capacitor. You may also notice jets aren’t working right or you can’t get the second speed to work. These are all be signs that the pump is in trouble and needs to be replaced. When it comes to replacing your spa pump, there are a few things to consider first before buying discount hot tub pumps. The place to start is looking at the existing pump label so you can find the frame size (48 or 56 frame). The motor inside the pump is configured either for a single or variable speeds. Almost all units are either one or two speed. Determine whether your hot tub pump is a 1 or 2 speed and if the operating voltage is 120v or 230v in order to find the right pump for your spa. Unless your hot tub is designed for upgraded pumps with added pressure for moving water faster, it’s generally not recommended to buy an upgraded pump. Replacing same type of pump will yield the best results. You can convert a 2 speed pump for 1 speed operation, but you can’t convert a 1-speed pump for 2-speed operation! You should ideally buy a pump that has as close to the same horsepower as the unit you are replacing. Ideally, the same level of power should be bought in order to avoid any potential problems. Going up more than two horsepower when getting a new pump is not recommended, as it could result in issues like damaged components or broken pipes that won’t be able to handle the added force. You should take note of the voltage of the original unit when finding a replacement. Pumps are constructed in only two voltages (120v or 230v), and the plug location on the circuit board or spa pack that will be supplying the power should be either 120v or 230v depending on the specifications. Getting one with the wrong voltage can cause damage to the motor, which will burn out fast. The wrong voltage can also create a fire hazard that can not only destroy the hot tub, but cause major damage and danger to the surroundings. So replace pump with same voltage type pump. Note that just because the spa pack operates at say 230v does not necessarily mean the pumps are 230v. They may be 120 volt pumps in a 230 volt spa, so check the label on the old pump for the proper operating voltage of the PUMP not the spa. For unbeatable prices in discount hot tub pumps, visit www. HotTubOutpost.com today! They have most replacement spa pumps in stock, including the most reputable brand names available, including Aqua-Flo, Executive 56, Waterway, Ultra Jet and others. They also carry spa pump parts – like wet ends, pump impellers, seals, capacitors and more. In addition to savings in prices, they also offer free shipping to anywhere in the continental US on most brand name hot tub pumps! Visit their website today to order your replacement spa pump. 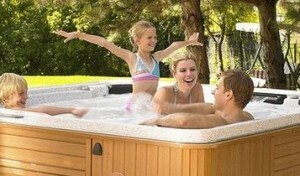 Save both time and money at www.HotTubOutpost.com. Check out their unbelievable deals on both new and remanufactured pumps for additional savings.